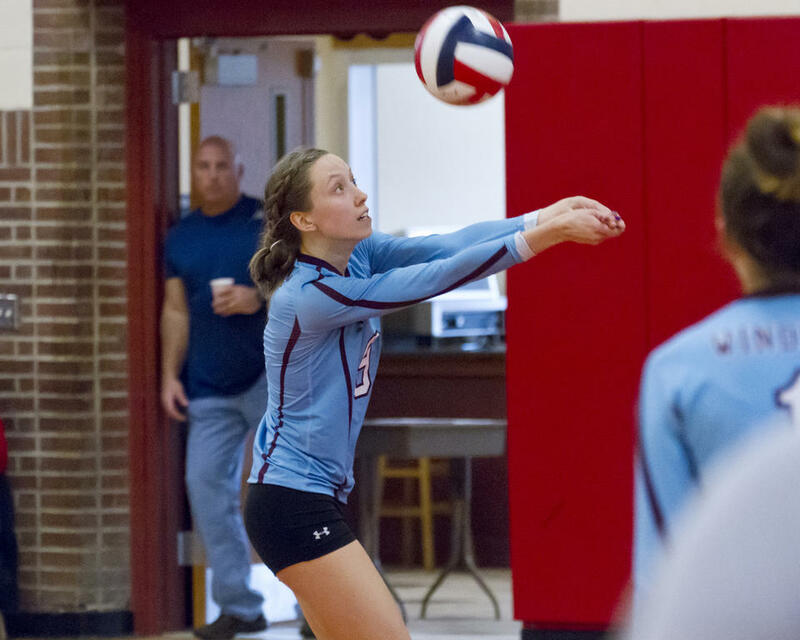 Home Lakes Region Weekly Raymond Volleyball: Windham quiets the Riots in straight sets. Volleyball: Windham quiets the Riots in straight sets. SOUTH PORTLAND—Meghan Harmon logged 10 kills to lead the Eagles in a straight-sets defeat of South Portland on Saturday morning, Oct. 6. Windham trailed only a couple times – at the start of the second and third sets – en route to the W over the Riots. The Eagles jumped out front 3-0 on the Riots to begin the first set, then steamrolled forward. Harmon set the scoreboard at 10-3 with an ace, Megan Fleck and Sierra Guite teamed up for a block at 13-5, and Morgan Proulx dropped a gentle touch in the midst of South Portland’s several girls for 14-7. The Riots battled admirably – Kelsey Shallow and Grace Rende, for example, combined for a block on Harmon and the team’s ninth point – but just couldn’t keep pace. Windham took set one 25-12. The Riots earned a 1-0 advantage, and then a 2-1 advantage, at the start of the second set. But they turned control over to their guests on a long serve at 2-2 and then began to fall behind again. South Portland posted better numbers as the set progressed, but found themselves trailing 17-12, then 18-12, on a pair of Guite tips, and 19-12 on a Lydia Budroe ace. Harmon capped the second with a tip for 25-18. South Portland inched ahead once more, 2-1 and then 3-2, at the outset of the third. Windham, however, surged in response. Harmon aced for 3-3, and again for 5-3. Alexis Budroe next made it 7-4 with a smash and 9-4 with an ace; Guite made it 12-5 with a tip and 15-6 with another tip – and so on and so forth. The morning concluded at 25-19 on a long South Portland serve. The win pushed Windham to 8-4 on the season. The Eagles, currently ranked sixth in Class A, have two more bouts left on their regular schedule – two more extremely tough bouts: Cape Elizabeth and Yarmouth. The Capers occupy the No. 1 slot in Class B, proud owners of an 11-1 record; the Clippers, meanwhile, occupy the No. 2 slot in Class B, at 9-2. If the Eagles can take down one or both of those outfits, they’ll score huge Heal Points heading into the playoffs, and likely bump themselves up in the standings, earning a better seed and thus a more favorable opponent in the early bracketing. South Portland, now 6-6, sits in seventh in A South. The Riots conclude their regular schedule with No. 10 Thornton (4-6) and No. 3 Scarborough (8-2). Kaitlyn Gedicks connects with a ball for the Eagles. Morgan Proulx chases a ball for the Eagles. Megan Fleck takes a lot of touches for the Eagles, often setting up her teammates. Sierra Guite brings imposing play to the net. Eagle Meghan Harmon is a force to be reckoned with at the net. Alexis Budroe winds up for an Eagles hit.